To help my K-5 students take advantage of the latest educational technology and to set them up for success in their lives after school, one of the fundamental skills I teach is typing. Earlier this year, I was looking for activities that would help my youngest students practice mouse skills and develop familiarity with the keyboard. 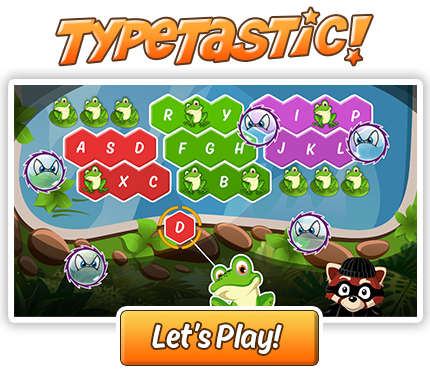 That’s when I discovered TypeTastic, which has a scope and sequence that aligned well with what I wanted to teach my K–2 students. We started using TypeTastic in the middle of the year. I explained to students that this new game would help them to improve their mouse and trackpad skills and help them learn where the letters were on the keyboard. Now, all of my classes use TypeTastic on their Chromebooks. Students love the colorful, encouraging games. This is the first keyboarding program that they beg to play and have extra time with. The order and progression of the games develops skills, and the fact that the games aren’t timed keeps them from getting frustrated. I had my kindergarteners start from the beginning, with letter-recognition games played with a mouse, and we still come back to the games as a way to practice pre-keyboarding in a fun way. For the 1st-grade students, we skipped the initial mouse-based games and jumped right into a game called Astro Bubbles, where students get rewarded for finding keys on the keyboard by being able to shoot a row colorful bubbles. The skills that my students have learned in TypeTastic apply to other tech tools as well: We had been using Wixie in kindergarten—mostly for the drawing and voice recording tools—but learning where the letters are on the keyboard has helped prepare my 1st-grade students to do writing projects on Wixie, too. I find that a game called Ducky Trouble, which requires spatial awareness and planning a series of steps, also teaches pre-coding skills, and I’ve used it as an introduction to our next unit on coding. My 2nd-grade students jumped right in to games that helped teach them the location of the home row. My 3rd– through 5th-graders spend most of their technology time using their keyboarding skills in authentic writing tasks. I only started this game-based approach to typing a few months ago, but I already see more comfort and improved keyboarding skills with my youngest students. I’m excited to see how using the whole series of games will enable students to be more proficient with keyboarding when they start their 3rd-grade activities next year. Michelle Eckstein is the elementary technology teacher at Peak to Peak Charter School in Lafayette, Colorado, and has worked in Boulder Valley Schools as a TAG educational advisor. In 2007, she founded an online program for gifted students called the Gifted Kids Network, which connects gifted students from rural communities in a safe online community. She can be reached at michelle.eckstein@bvsd.org. This blog post is adapted from the article “Typing is the Gateway to a Tech-Rich Education,” published by The Tech Edvocate.